Why use Concrete Reclaimers? 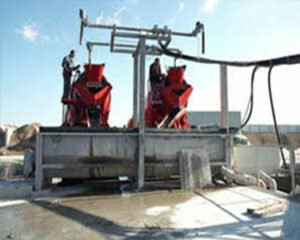 Recycling Concrete and the use of Concrete Reclaiming equipment has many benefits. It minimizes waste generated onsite, saves money, transportation time, and is ultimately better for the environment and your bottom line. Learn more. Buy, Rent or Lease-to-own any Concrete Reclaimer, or Concrete Recycling Equipment at Gulf Atlantic Equipment. We carry all major brands, as well as all Concrete Reclaimers Parts & Components. Our team can help you determine the exact equipment you need for each and every job site. We also offering worldwide shipping on all Concrete Reclaiming Equipment and Parts. Not sure what you need? Call 1-352-628-6674 for assistance.